Record registration numbers, sold-out exhibit hall at ASA Northwest's ATE Expo - AutoInc. SEATTLE, Washington — With record registration numbers and a sold-out exhibit hall, ASA Northwest’s 2019 ATE Expo is bigger and better than ever. On Saturday, the training rooms were full as Day 2 kicked into full gear. Featuring the top training names in the industry, the opportunities for learning were both numerous and packed. 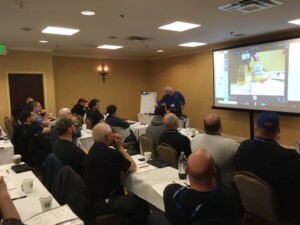 Technicians and shop owners attending ATE came from several states to take advantage of some of the best training available to help improve both business and technical skills. On Friday, the expo floor was busy as the biggest names in parts, business services, tools and equipment offered the latest technology available to improve productivity and enhance technical service capabilities for shops large and small. The networking continued on the show floor and in the halls, as ASA Northwest members shared their experience and wisdom with some new to the business and seasoned veterans at the reception on the show floor while spotlighting the value their ASA membership provides. The ATE event continues over the weekend, capping it all off with even more training and networking through Sunday. As one of the largest regional training events in the Pacific Northwest, ATE continues to grow and provide the tools and training necessary to help drive the success of their members and the industry at large.